I was flipping through a parenting magazine a couple of days ago, reading all the articles packed to the brim with how-to’s and good advice and words of wisdom…and I felt a familiar sinking feeling in the pit of my stomach. Familiar because I realized, surprised, that I always feel this way when I read parenting magazines – like everything I’m doing is not exactly right and that grave consequences will surely follow. I realized further, although fashion magazines get a lot of censure for giving girls negative body image, and impossible (and quite limited) standards of beauty, I have never, ever, in my whole life of reading fashion magazines, ever felt as insecure as I do when I read parenting magazines (and I am nowhere near svelte so I’m a prime target for fashion magazine victimization). Which was quite a revelation really – one would think that the opposite would be the case. But truth be told, not even a thousand skinny models with perfect skin and impossibly smooth hair could make me feel as, pardon the term, crappy, as a parenting magazine. And it’s not the features on the immaculate “supermoms” who can manage to have their children eating with chopsticks by 5, reading Jane Austen at bedtime, with enough time for regular ballet classes and play dates…no, it’s not them. It’s the articles. The articles about the “5 things you should never say…” or the “10 things every parent should know…” or “how to get your toddler to have better manners/not throw tantrums/clean up their rooms/play the kazoo”. It’s those articles that make me want to throw myself on the floor with my hand flung tragically to my temple and cry out, “no more!”. Why?, I wondered. I think it’s because parenting is so much more personal than dress size (well at least to me). We are so much more emotionally invested (naturally) in our children than the fact that, say, we can’t wear a certain cut of jeans because, um, baby’s got back. It’s our kids, our babies…we’ve only got this one shot (pulls hair out in dramatic gesture)! And of course, that sneaky, horrible mantra that weasels its way into our brains despite our best efforts…Am I a good mom? So, like those who have sworn off fashion magazines, I am swearing off parenting magazines. I’ll focus on having fun with my little ones, trying to keep my finger of the pulse of their needs, making life a little brighter, giving them what I want them to remember when they’re older. If I say the wrong thing, or use the wrong words, then we will just all have to live with that. And if I find myself once again in that treacherous juncture between not knowing what to do and feeling totally unsure of myself, I’ll take a deep breath, looking into their eyes, and into my heart, and hope to find the answer there. So…I haven’t read a parenting magazine (or any parenting articles) for three whole days and I am feeling splendid! Don’t you wish all life’s problems could be solved that easily? In any case, if you need something that won’t make you feel the least bit inadequate, try this sole. Five minutes under the broiler and dinner’s ready! You will feel totally competent! And it’s delicious. – Pre-heat the broiler in your oven to high. Mine doesn’t have any temperature settings at all — I just pre-heated it and it worked just fine. – Pat the sole fillets dry and lay them flat on a baking tray. – In a bowl, mix the butter, paprika, and oregano. Season with salt and pepper to taste. You want the butter to be well seasoned. 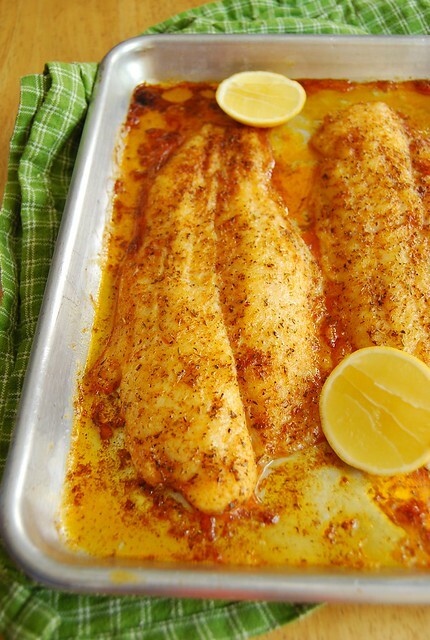 – Brush the fillets with the butter mixture. – Broil (top/middle rack) until golden and cooked through, with the butter bubbling temptingly at the edges, about 5 minutes or when the flesh flakes easily. – Serve with lemon wedges. When I saw the original recipe in Saveur I knew I had to try it right away. Without the hush puppies, the dish was dead simple…something I knew would be a great standby for those days when it feels like you don’t even have two minutes to rub together. Saveur calls for rainbow trout but as I didn’t have any, and don’t know where to procure it here, I settled for sole. But really, all white flesh fish would do well in this. Just adjust your cooking time accordingly to the size of your fillets. Some smaller pieces could take just 3 minutes. You can also play around with the seasoning in the butter…use your own favorite herbs and spices. I am sure a spicy version with cayenne and cumin would be fantastic. I know I have posted about easy dishes before, but this is almost criminally easy. Just spread your seasoned butter, then mere moments under the broiler, and you are set. When you pull out that tray of golden, buttery fish you will feel nothing short of accomplished. As far as parenting is concerned, I’ll be (happily) flying by the seat of my pants…and doing the very best I can. « The Wagyu Bacon Giveaway…We Have a Winner!! That looks delicious! A great recipe. Ooh, I love sole in lemon butter and yours looks absolutely ace. I would serve this with garlic-butter mashed cauli! Thanks for the fish recipe. Definitely a weeknight winner! And a way to get Himself to eat more fish!! Hi Ling! I know I am a hapless victim of all those parenting articles — they are certainly useful but I guess I need to not get too embroiled in each "how-to"! Hope you like the fish! Hi Jo! Aw! You are too kind! She has her moments…like all kids! 🙂 Yes, too long!! Thanks so much Betty for your kind words! I hope you enjoyed the fish!